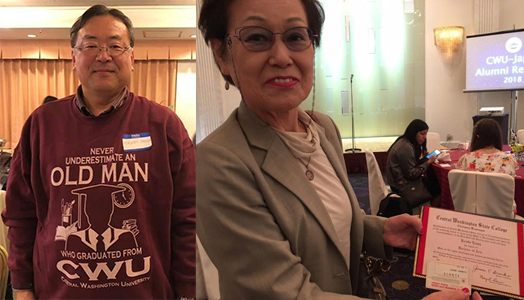 Alumni came as far as 2,800 miles away for the CWU Office of International Studies and Programs (OISP) second biennial alumni reunion in Japan earlier this month. OISP Executive Director Ediz Kaykayoglu led the university delegation attending the events in Tokyo, on November 4, and Osaka, on November 10. Atsushi Tannai, who graduated with an aerospace studies degree from CWU traveled from Bangkok, Thailand to the Tokyo event. He is currently the president of the professional services firm Siam Gen Co., Ltd., and a food safety specialist with the international sanitation business unit of Creo Co., Ltd. He was among the approximately 60 alumni and their families and others who attended the two reunions. In addition to provided food and beverages, participants met Kaykayoglu and fellow delegation members Nicki Kukar, OISP associate director and Asia University America Program (AUAP) director; Matt Britschgi, University English as a Second Language (UESL) director; and Rachel Gordon, OISP project manager. Through a video message recorded specifically for the event, the participants heard greetings and updates on the university from CWU President James L. Gaudino and Provost/Vice President for Academic and Student Life Katherine Frank. They also participated in fun activities involving CWU trivia and were presented convocation coins to commemorate their time at CWU. Along with alumni now living in Japan, and their family members, the attendees included former AUAP, UESL, graduate and undergraduate students, and study abroad participants. The alumni attending the Osaka event included Kazuko Uehara, who graduated with an art degree from Central in 1967. She took classes when it was still Central Washington State College. Photo: (L. to r.) CWU alumni Atsushi Tannai and Kazuko Uehara, with her CWU diploma.